I could use technical jargon, I could be very polite, OR I can simply tell the story as my viscera understood it. L’Orchestra Symphonique de Montréal—aka “OSM”—came to Toronto led by their music director Kent Nagano to play at Roy Thomson Hall tonight. At one point I sighed almost in synch with the person beside me, sensations verging on something sexual. All that was missing was the post-symphony cigarette, or a moment to ask “was it good for you?” But of course there was such a moment after, as the crowd went wild in appreciation. The OSM’s programme was a fascinating combination of old & new, all through a modernist lens. We began with Bach via Mahler, an idea of Bach that might be as obsolete as Stokowski (as in Fantasia), yet has to be respected, a way of understanding early music that is completely alien to modern ears accustomed to dry vibrato-less playing and historically informed performance. The “Suite for Orchestra, Harpsichord and Organ” by Bach, arranged by Mahler, resembles a greatest hits album –itself a curious anachronism that perhaps betrays my age—as Mahler assembled several lovely tunes into one entertaining collection. And yet I couldn’t help but notice that the OSM played this music in a way informed by the way we usually hear Bach, nowhere near as outlandish as I might have expected (and what we would have heard a century ago). Yulianna Avdeeva, who will be playing the Capriccio Nov 26 & 28 with OSM in Montreal. From a modernist sampler of baroque, we moved on to Stravinsky’s Capriccio for Piano and Orchestra, somewhere between neoclassical & primitivist, an exploration of sound and sonority. 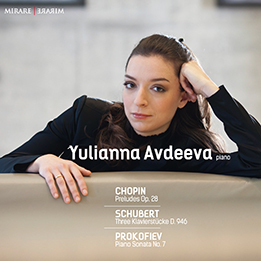 Yuliana Avdeeva was placed front & centre at the piano, addressing the keyboard in a manner reminiscent of a flamenco dancer or perhaps a bullfighter, her body making flamboyant gestures with her shoulders and arms, perhaps as an aid in the expression of phrases. I’ve never seen anything quite like it, although wow she sounds amazing. This is a deceptively challenging piece, one easily reduced to percussive attacks. Avdeeva brought a wonderfully fluid detachment to her phrasing, matched by a cleanliness of attack from this orchestra, so effortless in making a fulsome sound even when playing softly, but with that much more to offer when they decided to commit fully. Final item on the program was another modernist piece. I’ve always felt a strong connection between Mahler & Shostakovich (I’m not the only one, if you google it further), the Russian taking Mahler’s forms a few steps further harmonically & rhythmically even while seeming to emulate some of his choices. Tonight for instance in the 10th Symphony, the two inner movements have the kind of colourful vitality you find in Mahler’s later symphonies. After the restraint of the first movement, the second movement is an ecstatic explosion of passion, the third another wild display. Nagano is a very skillful conductor, whom i admired in his appearance with Tafelmusik last year. He lets this music breathe, so that although there are moments throbbing with intensity, there are lots of soft reflective passages as well. This is a mature ensemble who turn on a dime, agile & supple, with just the occasional glint of teeth and claws as though wanting to remind us of our feral past. I’m glad they took me along for the ride. FYI, L’Orchestre Symphonique de Montreal play this program again Nov 26 & 28 (back home in Montreal). This entry was posted in Music and musicology, Reviews and tagged Dimitri Shostakovich, Igor Stravinsky, JS Bach, Kent Nagano, Orchestre Symphonique de Montreal, OSM, Yulianna Avdeeva. Bookmark the permalink.